Traditionally, the family was the only provider of insurance against unforeseen events such as illness and unemployment. Today, most high-income countries have comprehensive welfare systems that provide public insurance. Nevertheless, the family may still play a role in sharing risks and smoothing consumption over time (Blundell et al. 2016). In order to design optimal social insurance policies, it is important to understand how the two potential providers of insurance interact, and a substantial literature studies the so-called added worker effect in different institutional and cultural environments (Lundberg 1985, Cullen and Gruber 2000, Bredtmann et al. 2018). In a recent paper (Halla et al. 2018), we examine labour supply decisions of married couples in Austria. In an empirical analysis based on detailed administrative data, we focus on a sample of about 48,000 couples where the husbands lose their job due to mass layoffs or plant closures.1 The setup provides a precise timing of the income shock to the household and a credible identification of causal responses. We use three different control groups to estimate the effect of the husband’s job loss on the spouse’s subsequent labour supply. The first control group consists of couples with husbands working in firms without mass layoff or plant closure. The second control group consists of couples where husbands work in firms with a mass layoff, but who are not laid off themselves. Both control groups have strengths and weaknesses. In the former case, one might worry about selection of workers into firms, while in the latter case one might worry about selection into layoff within firms. To address these concerns, we use a third control group. Here, we do not sample individuals who were not displaced. Rather we exploit the timing of firm events and construct control groups of workers who are displaced themselves, but at a later date. The top panel of Figure 1 shows the difference in the quarterly employment rates between displaced husbands and the control group, while the bottom panel shows the corresponding graph for their wives. We find that husbands have on average a 16-17% lower employment rate and lose 21-24% of their earnings over a five-year period after displacement relative to the control group. The labour supply responses of wives are positive and statistically significant. This effect is in line with the insurance motive and is typically referred to as the added worker effect. However, the additional earnings generated by the wife are small compared to the husband’s loss. On average, the female employment rate increases by 1% and earnings by about 2%. These main results are remarkably consistent across the three control groups. 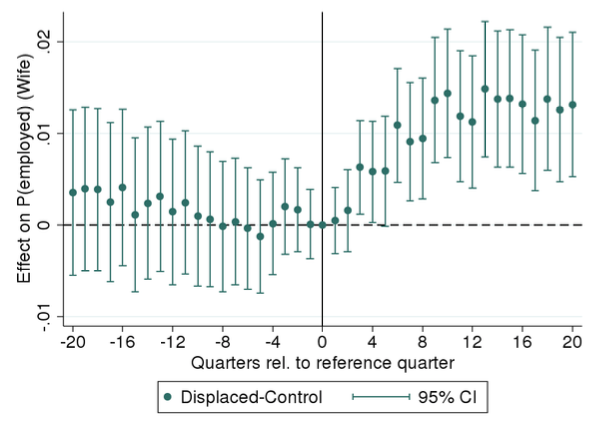 Notes: These figures plot the difference and the corresponding 95% confidence intervals of the probability to be employed between displaced husbands and reweighted husbands without any firm event at the reference quarter (top) and their wives (bottom) relative to the difference in the reference quarter. Compared to public insurance via government transfers and the tax system, the intra-household insurance mechanism plays a negligible role, as the wives’ labour supply recovers only a tiny fraction of the overall loss in household income. Figure 2 illustrates that the most important insurance component is unemployment benefits, which cover the large initial drop in household income following the job loss. However, due to the time-limited benefit durations, the longer-term losses in household income are not covered by government transfers. Notes: This figure shows the effect of husband’s displacement on monthly household income measures. 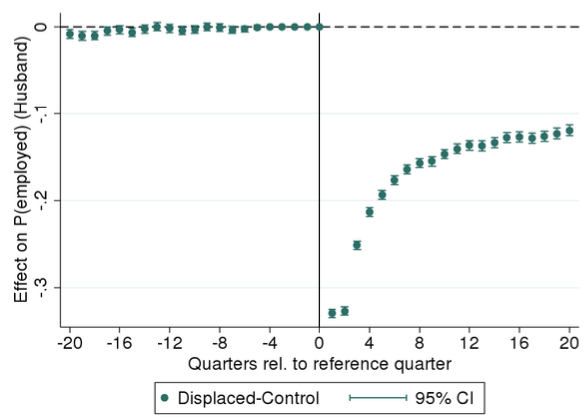 The effect is given by the difference between households that experience a displacement and reweighted and mean-adjusted households that have husbands without any firm event at the reference date. Household Gross Earnings is the sum of husband’s and wife’s labour earnings in each quarter according to tax data. Household Net Earnings subtracts social security contributions and payroll taxes from the former. 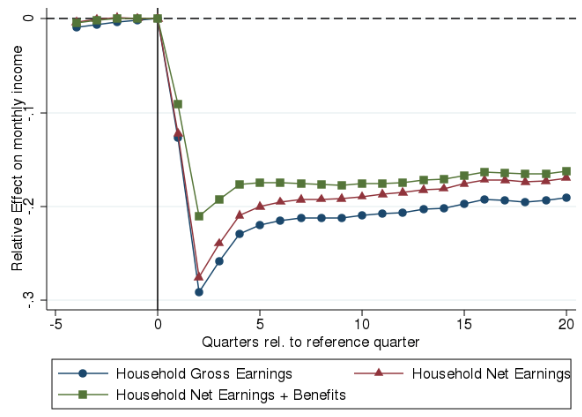 Household Net Earnings + benefits adds benefits from unemployment insurance and unemployment assistance. To find explanations for the low insurance value of female labour supply within the household, we investigate additional outcomes, such as job search, fertility, and divorce, and analyse the heterogeneity in responses by household characteristics. Our results indicate that gender roles, preferences for time spent with children, and availability of formal childcare play a strong role in the wives' labour supply decisions. Wives and husbands are not willing to switch roles in the care of small children in response to a shift in relative wages when parental leave benefits are available but childcare outside the home is absent. Nor are wives without children who are already participating in the labour market prior to their husbands’ income shock willing to extend their working hours and increase their earnings. The most responsive group are mothers of children aged three and older who are in the process of re-entering the labour market after a maternity break. These women are willing to bring forward their labour market re-entry. Overall, we find that the intra-household insurance mechanism is muted in Austria in comparison to evidence from other countries. This suggests that insurance is not a dominant motive for marriage in Austria and other aspects such as the division of labour may be more important. Our estimates point to the importance of childcare or housework, where roles within the family seem clearly defined. Thus, the comparably low added worker effect may be explained by traditional gender norms that determine the role of women in the household (Bertrand et al. 2016) and the importance of the male breadwinner model (Kleven et al. 2018). Survey data indeed suggest that Austria has comparably strong gender norms. 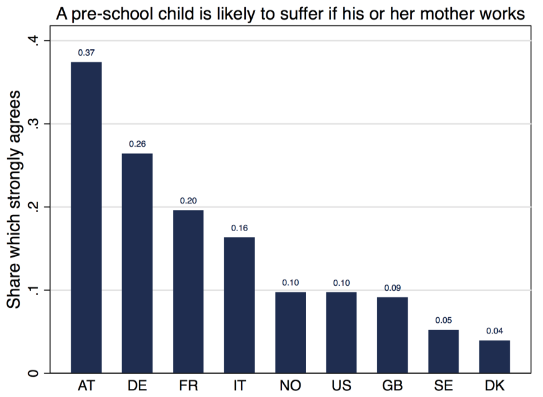 Figure 3 shows the share of individuals who agree with the assessment that “a pre-school child is likely to suffer if his or her mother works” for several countries. In this comparison, Austria stands out with more than a third of respondents who strongly agree. Notes: Figure shows the share or respondents, who strongly agrees with this statement. Data: European and World Values Surveys, respondents aged 25-55, country observations from at least two points in time (1990-1999). Based on these findings, we identify different types of policy that might strengthen the intra-household insurance channel. The first type of policy targets the re-entry of mothers into the labour market after a maternity period by strengthening the job guarantee (Lalive et al. 2014), expanding subsidised childcare, and providing active labour market programmes for young mothers. A second type of policy targets fathers' involvement in childcare at home, for example by reserving part of the parental leave for fathers (‘daddy months’). Finally, policies targeting unemployed workers should take into account the household situation and extend job search counselling to the spouses of unemployed workers. Bertrand, M, P Cortés, C Olivetti, and J Pan (2016), “Social Norms, Labor Market Opportunities, and the Marriage Gap for Skilled Women”, NBER Working Paper 22015. Blundell, R, L Pistaferri, and I Saporta-Eksten (2016), “Consumption Inequality and Family Labor Supply”, American Economic Review 106 (2), 387–435. Bredtmann, J, S Otten, and C Rulff (2018), “Husband‘s Unemployment and Wife‘s Labor Supply: The Added Worker Effect across Europe”, ILR Review 71 (5), 1201–1231. Cullen, J B, and J Gruber (2000), “Does Unemployment Insurance Crowd out Spousal Labor Supply?”, Journal of Labor Economics 18 (3), 546–572. Halla, M, J Schmieder, and A Weber (2018), “Job Displacement, Family Dynamic, and Spousal Labor Supply ”, CEPR Discussion Paper 13247. Kleven, H, C Landais, and J Søgaard (2018), “Children and Gender Inequality: Evidence from Denmark”, AEJ: Applied Economics, forthcoming. Lalive, R, A Schlosser, A Steinhauer, and J Zweimüller (2014), “Parental Leave and Mothers’ Careers: The Relative Importance of Job Protection and Cash Benefits”, The Review of Economic Studies 81 (1), 219–265. Lundberg, S (1985), “The Added Worker Effect”, Journal of Labor Economics 3 (1), 11–37. In Austria, private sector workers are automatically enrolled in the universal unemployment insurance system. Eligibility for and duration of unemployment benefits depend on the individual's work history and age. Benefits replace around 55% of the previous net wage and job losers in our samples can receive benefits for 20 to 39 weeks.